Vodafone is offering unmetered international calls and double the data on select plans as it leverages its global network to compete in the Australian prepaid market. The company’s revised $50 prepaid cap includes unmetered international calls to 10 countries, in addition to unmetered national voice calls and 3GB of Internet data allowance. Offering “infinite” international voice calls to select countries will help Vodafone fend off competition from Voice-over IP (VoIP) applications that use people’s existing data allowance to make International calls, such as Skype and Viber. Vodafone can offer unmetered international voice calls to select countries “because Vodafone is part of the world’s second largest mobile network,” said Mahul Dave, the managing director of Vodafone’s prepaid division. The 10 countries covered by the $50 prepaid cap are: China, India, USA, UK, New Zealand, Singapore, Thailand, Malaysia, Hong Kong and South Korea. 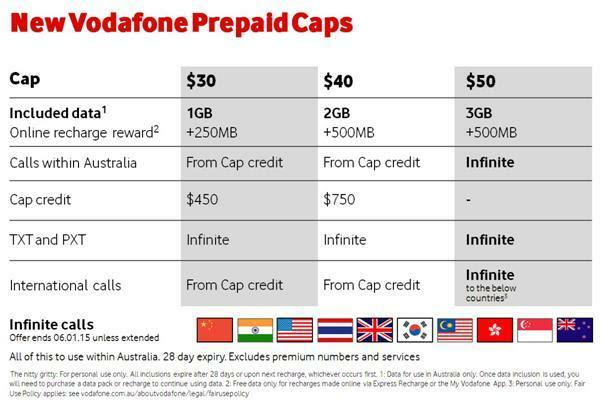 Vodafone’s $30 and $40 prepaid caps will have their data allowances doubled to 1GB and 2GB respectively. A further 500MB of data is available if people recharge a $30, $40 or $50 do so using the MyVodafone app or its online web portal. Read more: Apple iPhone 6 Plus: Does the world need an Apple phablet? Vodafone’s refreshed prepaid caps will be available for new and existing customers on 24 September.